No matter how beautiful the strategy of an organization, if not well executed, it will fail. People (employees) are required to make strategy actionable. So without people, strategy cannot be implemented. As illustrated above, strategy is translated from the corporate level (Tier 1) to departments and in the same manner, department strategy is cascaded to teams and individuals within the department for proper alignment. However, it should be noted that among all strategic elements (including, Mission, Vision, Strategic Theme, Strategic Objective, Performance Measures, Targets and strategic Initiatives etc.) only Strategic Objectives are cascaded. This is because of the need to have employees to first focus on the results the organization wants to achieve and only thereafter, on the required actions or tasks. 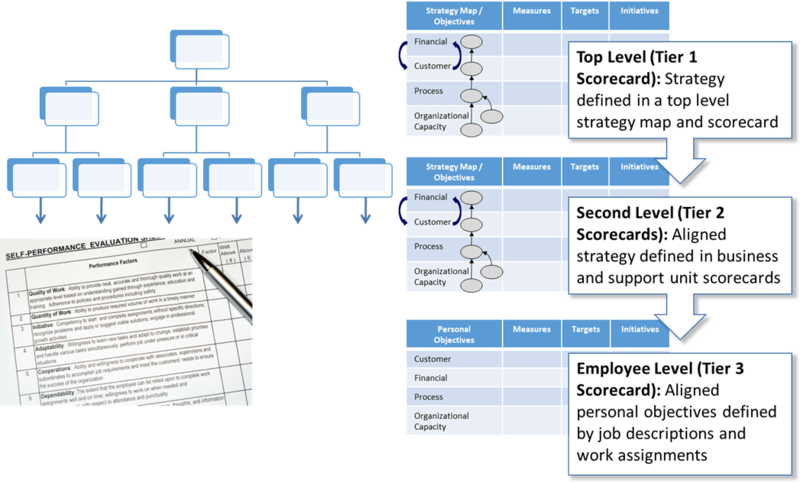 Developing individual SMART Objective Scorecards is the final step in the cascading process; more so, it is very important in strategy execution as strategy is being executed at individual level. M- Measurable: Meaning any objective developed must be capable of being measured. A-Achievable: Meaning any objective developed for any employee must be attainable i.e. the individual must have capacity and resources to achieve it. R-Result-focused: Meaning that whatever objective is set for any employee must be relevant to the result(s) being pursued by the organization. Time-bound: Meaning the objective set for individual employee must be achieved within an agreed or specified time frame. Mapping of employees’ JDs with their respective department strategy. The essence of this is to ascertain the number of departmental results supported by each employee and how many employees support each of the departmental result. Developing Tasks to be carried out in order to deliver the SMART Objectives.